It hasn’t even been a week since we launched the “I LOVE PARIS” contest for Paris Voyage on Facebook and we already have over 1,000 entries! Not bad at all for a relatively new company. In addition to the entries, their fan base is growing at the rate of almost 100 per day. Of course, this is one of the more fun Facebook pages that Buzz Accelerator manages. I mean who doesn’t want to go to Paris??? But really, any company could be doing this to grow their fan base and email list. It may seem complicated with all the rules and everything–but don’t worry–we’ve got you covered. Buzz Accelerator takes care of all the graphics, helps you navigate and adhere to the rules, makes regular postings throughout the contest cycle and provides bonus promotion to accelerate your buzz and get you maximum exposure. If you want information about running a contest or sweepstakes for your company give us a call. We’ll be happy to help. 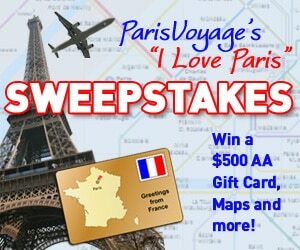 And make sure you enter the Paris Voyage “I Love Paris” Sweepstakes. There are over 100 prizes to be won!